A Paulanergarten is much more than a place, it’s a lifestyle. Whether in Munich or Shanghai, it stands for enjoyment and conviviality, tradition and friendship. Of course, it’s always informal and casual. In short, it’s where things are exactly as they should be and where Bavaria is the most beautiful – even though some wonderful Paulanergärten lie outside of Bavaria's white and blue borders. Beergardens have been an inherent part of Bavarian tradition, embodying “Gemütlichkeit“ (hospitality) for over 200 years. 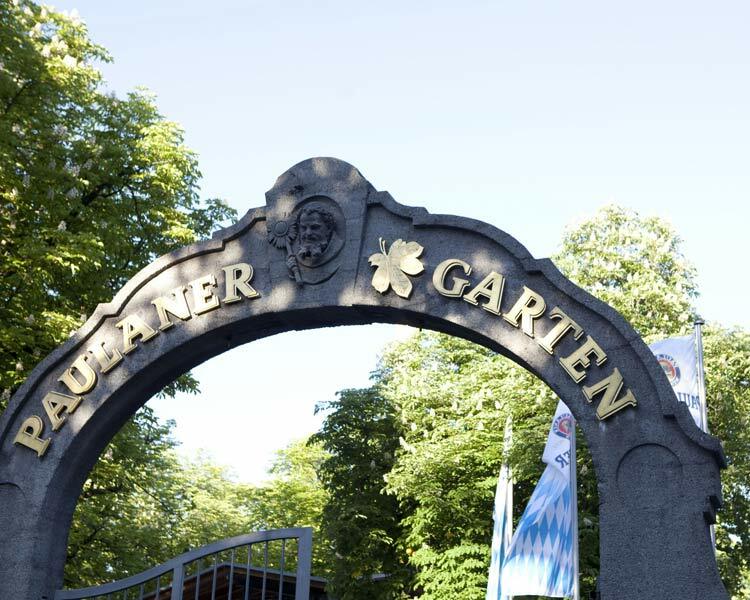 The origin of the beergarden dates back to the 16th century in Munich. We owe this heavenly place on earth to the brewing methods of the time and to the Bavarian brewing regulations of 1539 – although both of these almost caused an entire summer without beer in Bavaria. Because at this time beer was brewed using bottom fermentation, which takes place at temperatures between 4° and 8° Celsius, successful fermentation could only occur during the cold months. Furthermore, because the hot brewing kettles had been causing terrible fires in the summer heat, brewing was only permitted between September 29th and April 23rd, as per the historical and traditional brewing regulations at the time. In order to be able to provide beer during Munich’s summer months, beer had to be brewed in the winter, followed by several months of chilled lagering: a true challenge. Bavarian inventiveness led to the idea of storing beer in deep cellars to keep it cool. These cellars where naturally chilled by gravel spread above ground and shade from chestnut trees planted on top of the cellars. Thanks to their shallow roots, the chestnut trees caused no damage to the cellar vaults and are still a typical feature of beergardens today. Back then, the brewery sites were located outside the city and quickly became popular destinations for Munich’s citizens. At first, people just picked up the cool, fresh beer to take back home with them, but soon Bavarian hospitality prevailed and the beer began to be enjoyed directly underneath the large treetops of the chestnut trees. The brewers set up simple tables and benches to accommodate the people – the beergarden was born. As a result, small breweries and inns began to feel robbed of their customers. So they approached King Maximilian, the first King of Bavaria, with their concerns. In 1812, this Wittelsbach King finally declared a compromise – thank goodness – to keep the extremely popular beergardens in business. But in order to protect the businesses of Munich’s restaurateurs, no food items, with the exception of bread, could be sold. Without further ado, the people brought their own homemade dishes, thus beginning this wonderful custom, which - to this day - is still a tradition in many beergardens. The Oktoberfest (also known as the Wiesn) is the largest festival in the world, attracting over 6 million visitors each year. A record ~7 million litres of beer were served in 2010 at the 200th Oktoberfest celebration. It all began as a horse race in October of 1810 for the royal wedding of Bavaria’s crown prince Ludwig to princess Therese of Sachsen-Hildburghausen. The idea came from the non-commissioned officer of the national guard, Franz Baumgartner, who recalled the almost forgotten scarlet races popularised during the Middle Ages, where the winner waved a valuable scarlet scarf. King Max I. Joseph was thrilled at the idea and eventually arranged for the horse races to be held on the meadow in front of the city’s gates. It is clear why the field subsequently became known as Theresienwiese (Theresa’s field). It was great fun! And so the horse race was repeated. So, in 1818 the first innkeepers and fairground attractions began to emerge around the royal tent. From these, larger tents and the first rotisserie chicken booth ensued. Little by little, the festival grew to what it has become today, with new traditions developing along the way. The first mayor to tap the first barrel for the opening of Oktoberfest was Thomas Wimmer in 1950. Since then, it has become a ritual that no city leader is willing to relinquish. Munich’s love for the Wiesn remains unbroken and the city rejoices each year when the incumbent mayor calls out, “O’zapft is” at the opening of the Oktoberfest. Every year, the official prelude to Oktoberfest is the grand entry of the tent operators’ families and the Munich breweries. The tent operators, along with their families and guests, cheer to the spectators from their beautifully decorated horse carriages. 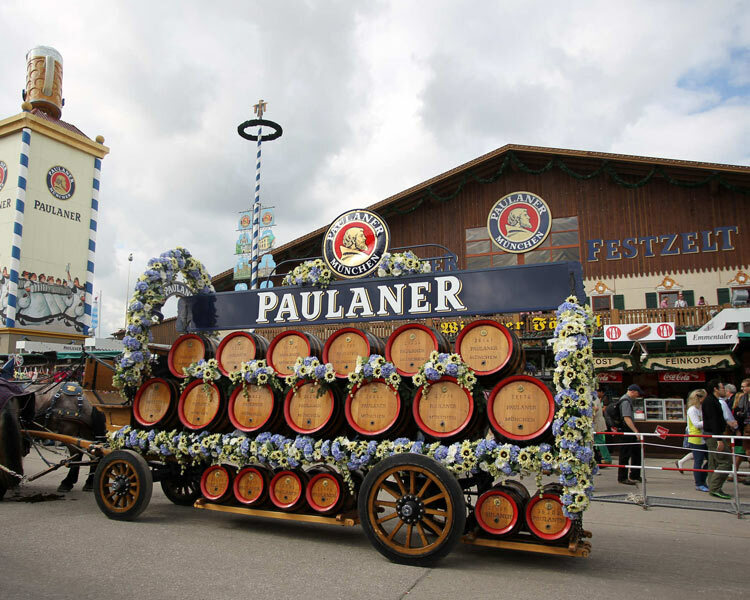 Magnificent horse drawn drays from the breweries, marching bands and the traditional costume and riflemen’s procession, form the imposing triumphal procession, led by the Münchner Kindl (Munich child) and the mayor of Munich. First held in 1835 to commemorate the silver anniversary of Ludwig I and Therese of Bavaria, the costume and rifleman procession has become the most important event at the Wiesn since 1950.